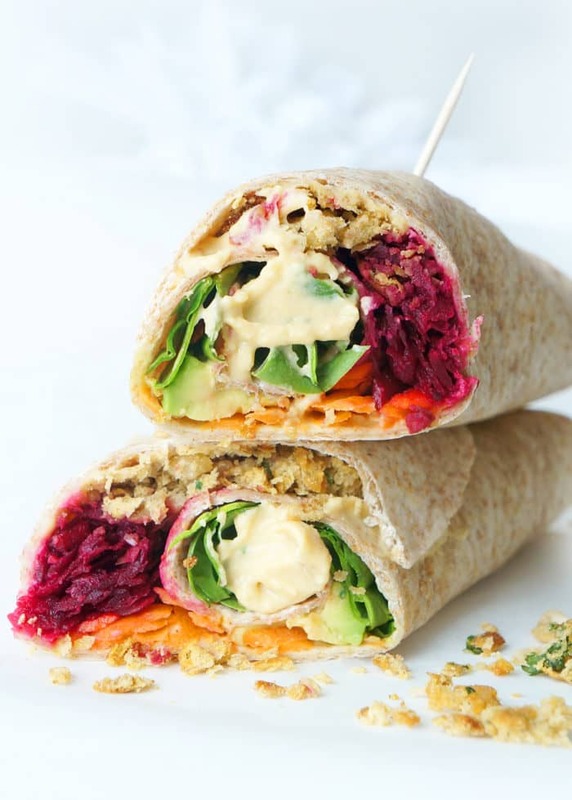 These vegan rainbow falafel wraps are packed full of colour, flavour and nutrients! Whip up a batch of falafels ahead of time and assemble these wraps throughout the week for a quick, easy and healthy meatless meal! Vegan, dairy-free, & gluten-free. During my recent pregnancy, I had some mega food aversions during the first trimester. I was SO turned off any type of meat, especially chicken and fish which were formerly major staples in my diet. I was also really turned off cooking. The smell and even the sight of food made me sick. The joys of pregnancy. Because of my disinterest in cooking, I had to resort to eating out a little more frequently than what I was used to, BUT I still wanted to stick to a relatively healthy diet. On a quest to find healthy options that didn’t involve meat, I discovered this cute little local vegan cafe in our area. The foods were all prepared from scratch and they had a really interesting selection of meatless menu items. So much so that I had trouble ordering something off the menu. It all sounded SO good! 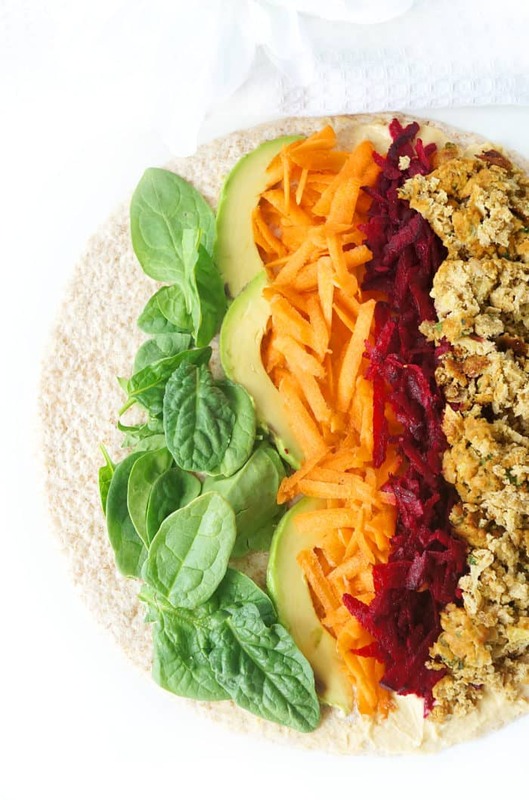 I’ve always been a huge fan of falafels and it was something that I could actually stomach during my pregnancy, so I decided to go with what was known as the “Seeker Wrap,” which basically consisted of beets, carrots, avocado, fresh spinach, hummus, and falafels. Doesn’t that just sound like a party in your mouth?! It was hands down one of the most beautiful wraps I had ever set my eyes on….not to mention it was absolutely delicious! It was packed full of colour and flavour and I couldn’t believe how filling it was. Fast forward several months later, and I’m still dreaming about this wrap. That’s the impact it had on me! A few weeks ago, I decided to make up a big batch of falafels. My husband and I both love them so I try to include them every few weeks in our menu rotation. I was craving a Seeker Wrap, so I thought, why don’t I try to replicate it? So I set out to gather up all of the ingredients and started preparing the wraps. I spread a thin layer of hummus all over the tortilla to add some flavour and act as a glue to keep all of the ingredients in place. Next, I started placing each of the ingredients in strips across the wrap. It was so pretty! It seriously reminded me of a rainbow. Next, I carefully and tightly rolled up the wrap and secured it with two toothpicks to prevent the contents from falling out. This could potentially be a very messy wrap, so you’ll need those toothpicks! Sure enough, it turned out just as good, if not better, than the wrap from the cafe! I just can’t find enough words to describe this wrap. There are so many nutrients from all of the colourful vegetables ranging from vitamins A, C, E, and K to potassium and iron. Plus the wrap, falafels and hummus add a dose of fibre and protein to keep you feeling full and satisfied. 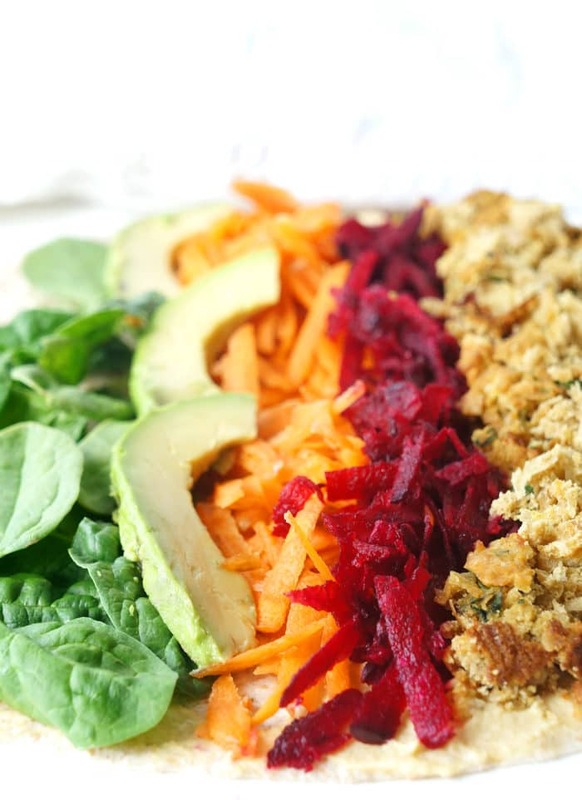 You really can’t go wrong with this gorgeous and tasty meatless option! I also found it so easy to prepare especially since I had made the falafels the night before. For a really quick and easy meal, I recommend making up a bunch of the falafels in advance so that you can enjoy this tasty and nutrient packed wrap for lunch or dinner all throughout the week! All you have to do is assemble and you’re good to go! Divide hummus evenly and spread across each of the four wraps, leaving about an inch around the edge. 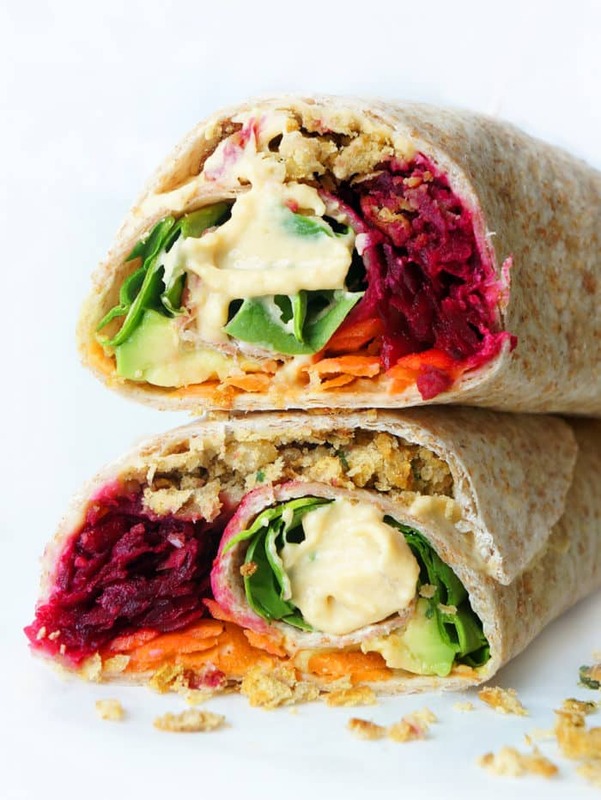 Starting from the left of each wrap, add a strip of baby spinach, sliced avocado, shredded beets, shredded carrot and two crumbled falafels. 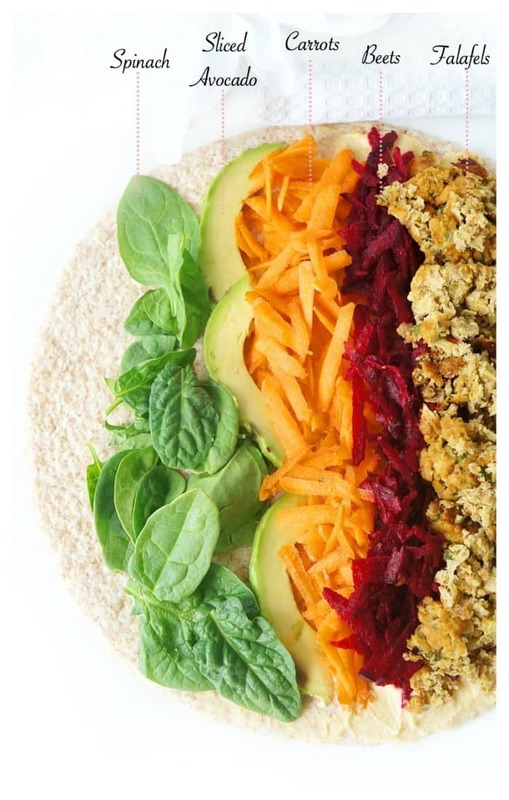 Roll the wrap tightly, ensuring that all the ingredients stay in the wrap. Secure with toothpicks and slice wrap in half. Serve and enjoy! Thanks Deborah — I totally agree! You can’t go wrong with falafels and hummus! I love all the colors. What a fun recipe! Thanks Abbey — there’s definitely a lot of good stuff happening in this wrap! Elysia this is my kind of lunch. Looks so good. Thanks Jill! It’s definitely tasty! This looks so pretty and colorful! I love Falafel but have never made it myself. Thank you Carrie! You should definitely try making falafels. They’re SO good from scratch! 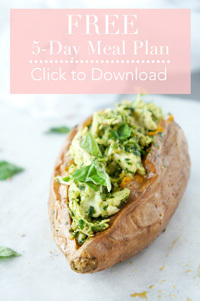 Just whip up a batch and you can eat them for a quick and easy meatless meal throughout the week! Loving all the flavors of this. I love a good falafel sandwich, so I can’t wait to try this. Thanks Mikki! Hope you enjoy the recipe! This is beautiful! Falafel is one of my favorites, but something I never make frequently enough at home! Thanks Heather — can never have enough falafels! My pleasure Mandy! Let me know how you like the wraps if you have a chance to try them out! I totally agree — baking falafels is just as tasty as frying them and so much healthier!